A friend of mine, in one of those threads elsewhere about "where I was when I heard about the assassination of John F. Kennedy fifty years ago", remembered his mother coming up the stairs in their home, in tears, shouting that "they've killed the President." I don't think that this was so unusual, in the first moments of assimilating the news, as vague as the information was at that point, to jump straight to the assumption that it had been some conspiracy, a sophisticated act planned and carried out by a group of villains, representing some organization or consortium of organizations (rogue government agencies, political opponents, big business interests, organized crime, international agents...), rather than the work of a lone gunman, hence an automatic presumption "they've killed" instead of the much more probable "someone killed". I think that this was because a conspiracy gave the event more sophistication and more complexity than the crazed action of one nut with a gun, and that this sophistication and complexity was somehow more appropriate to the weight of the assassination. Oddly and persistently, it gave a degree of meaning and even dignity to the event that was missing from the single shooter narrative, which would have reduced the story to a near random event, and one of near-meaninglessness. And we've had fifty years of this*. There is often a kind of rage for complexity born out of this need to find more meaning in things or events. And it, in turn, often leads to finding complexity when there is actually very little and, conversely, a reluctance, if not inability to find the complexity in phenomena which appear externally to be clear and apparently simple. As examples of the former, I find a lot of self-identified "complex" music which does may have a densely notated, highly variegated score, but results in masses of sound from which meaningful details cannot be retrieved and also, via the sheer volume of information, incidents of cohesive relationships which are actually accidental, not evidence of depth. And from the latter, I think it is often lost in the slick attractive surface of a work using minimal means in one or more dimension, that those reduced means have been chosen explicitly for their capacity to frame or underline, or otherwise make more audibly articulate details of great subtlety and complexity (La Monte Young calls it "getting inside a sound.") In the radical music, never assume that a "complex" composer actually produces significant levels of complexity and never assume that a "minimal" composer has not. This is clearly an area in which the radical music productively plays with the perception of trees vis a vis forests (and vice versa) and also in which not only the ratio of signal to noise is in play,it's not always clear what is signal and what is noise. Some signals are inherently noisy. Some noises make useful signals. Deal with it. * I can't help but point to Errol Morris's new short video about Josiah “Tink” Thompson and the photographic evidence from Dallas. As a lifelong player of games (cards, mostly, poker in particular, but I've been enjoying the current chess championships as an observer (never having been the least bit good at playing the game, I did go through an Edgar Rice Burroughs and Martin Gardner-inspired adolescent phase of designing chess variants — boards with alternative geometries, pieces with alternative moves, more than two players in teams and alliances, uneven distributions of pieces and real estate, alternating moves in patterns other than black-white-black-white etc. )), I am fascinated both with the consequences of playing according to a fixed set of rules and with the possible consequences when even the slightest variations in those rules comes into play. There is a real thrill here at the possibility of a single grain of sand moved slightly giving rise to completely different universes. This thrill is aesthetic, and I find it in every piece of music that thrills me. It used to be the case, in composing, that I would set up my rules in advance of composition and then keep strictly to them. Nowadays, although I believe that I work just as strictly in my pieces, I don't always begin with all the rules laid out in advance. Instead, I let them emerge as problems and possibilities arise and then, deciding on a rule, stick with it. This strikes me as more in line with the way that social and political worlds actually work. Even if you start out with some formal constitutional arrangement, whether minimal or maximal in scope and detail, something is either left out, or gotten completely wrong, or some unforeseen or even completely unimagined configuration arises demanding substantial decisions on the spot. And that process of dynamic decision making, requiring the near-spontaneous articulation or clarification of the problems and possibilities can be a compelling activity in its own right. The presence of a set of rules won't guarantee that a piece (and they certainly don't make a society) will work automatically, indeed at all — and indeed, the most immediate thing a rule may define is often only its violation, not its successful implementation —, but they can create structures and opportunities to make it work with far less anxiety than operating from brute force. This past year has been one spent more with experimentation, and rule-based experimentation at that, than with producing musical scores with the shiny veneer of the well-finished. For example, I've made a number of small pieces — amateur pieces for friends, most of them not for publication — for solo instruments based on the rhythmic and sonic patterns and structures of poetic forms (sonnets, sapphics, rondeaus, limericks etc.) which have introduced some musically potent new ideas about local and global rules into my music. And yes, the play of composing (as Lou Harrison put it) is very much here as well. Viola Rusche and Hauke Harder's film about Alvin Lucier, NO IDEAS BUT IN THINGS has finally been released on DVD by Wergo. This a beautiful, spacious work of film making, with the single most breathtaking direct cut in any film I know. Wergo's page is here. A web site dedicated to the film is here. 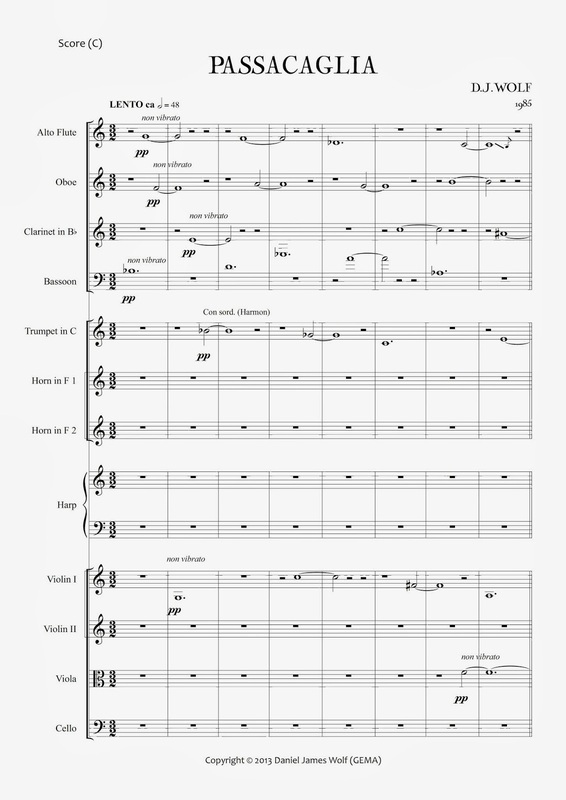 In the summer between finishing my MA and starting work on a PhD, thus temporarily without academic attachments, I wrote the eight-minute-and-change score that might be my first grown-up piece, a Passacaglia for chamber orchestra. It's only been read-through once, and that didn't go as well as I would have liked, and I'm not altogether enthusiastic about pushing it for performance rather than more recent music, but it was a milestone for me in terms of identifying a personal sound or style. This was the first opportunity to work out the terms and possibilities of the "dysfunctional" or "not-yet-tonal" voice leading style I would call my own, my personal Harmonielehre. This Passacaglia has a repeating core melody, but it's not (at least not always) the bass line, rather one of three inter-twining lines in a continuity that sits mostly in the middle register. And this melody is not fixed in length, but expands through interpolated tones. 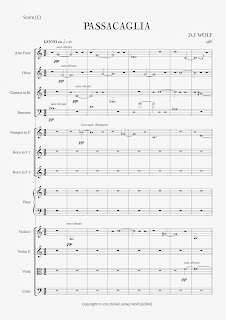 The piece is in 3/2 time and the prevailing texture could be thought of as a species of counterpoint conspicuously left out of Fux: each voice plays a series of dotted wholes, staggered by half-notes, creating double suspensions. The treatment of consonance and dissonance (and everything useful in-between) is my own: voices lead but are not necessarily followed; the presence of tonality can be suggested by local emphases on small collections of tones; spectrum-like arrangements of harmonies can form a local optimum but music doesn't move in continuous optima... I do expand the dotted wholes and overlap some statements, creating denser harmonies, but the basic texture remains this staggered three-voice pattern, the instrumentation varying from changing colors with every tone to more homogeneous scorings (yes, Webern's Op. 1 is in the genetics of this piece, too.) All of this is done with the ad hoc mixture of system and spontaneity that still operates in my work. Written in Morro Bay, where my grandparents lived and an uncle owned a wonderful bakery, I can't help but think of this music as Californian in character: both substantial and eccentric, cool but caring. In case you don't know it, Stephen Soderberg's blog Essays & Endnotes is one of the best things going of late, if you have an interest in the some of the possible relationships between notes and numbers. Steven shares my enthusiasm for perfect shuffles, but takes it well into mathematical territory outside my modest expertise. Ultimately, this is all about how the workings of simple systems can create lively music. Recommended for people who like the music of Babbitt or Krenek, but also those who like that of Tom Johnson. Stephen is on a small break from blogging at the moment, so it's a perfect opportunity to catch up with some very long threads. Also this: the second part of Franklin Cox's virtuoso take-down of Taruskin's is now online at the Search Journal for New Music and Culture. While I have a handful of tiny quibbles (i.e. I can't quite agree to identify Benjamin Boretz as a "formalist" (a point which is somewhat ironic in this context, given Boretz's very explicit turn from a formalist program, culminating perhaps with the treatment of Sleeping Beauty in his Meta-Variations), I think Cox is very solid here in his criticsm of Taruskin on both matters of musicological evidence and opinion.